Designed as a hub for the arts, sciences, and engineering on the River Campus, the new Ronald Rettner Hall for Media Arts and Innovation provides a place for students to gain both practical skills and theoretical understanding of digital technology. 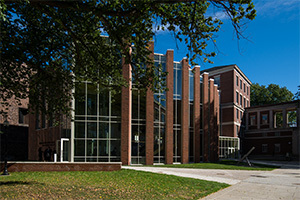 Located in the Wilson Quadrangle on the River Campus between Wilson Commons and Morey Hall, the three-story, 18,900-square-foot building features an engineering fabrication lab where students can build project prototypes, a multipurpose learning studio, group study areas, and exhibit space for students to display their projects. The new building also contains sound and video recording studios, high-end computers, and 3-D printers, which represent the latest manufacturing technique to convert digital design software into actual models. Rettner Hall’s open design features space on each floor overlooking the level below to encourage collaboration. With flexible spaces specifically designed for interaction, it will be open 24 hours a day. 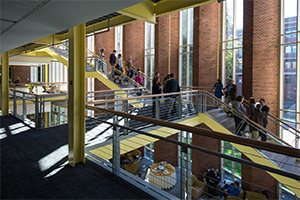 The new building also houses two of the University’s academic programs: digital media studies and audio and music engineering. The building is named for University Trustee and philanthropist Ronald Rettner who provided the lead gift for the project.